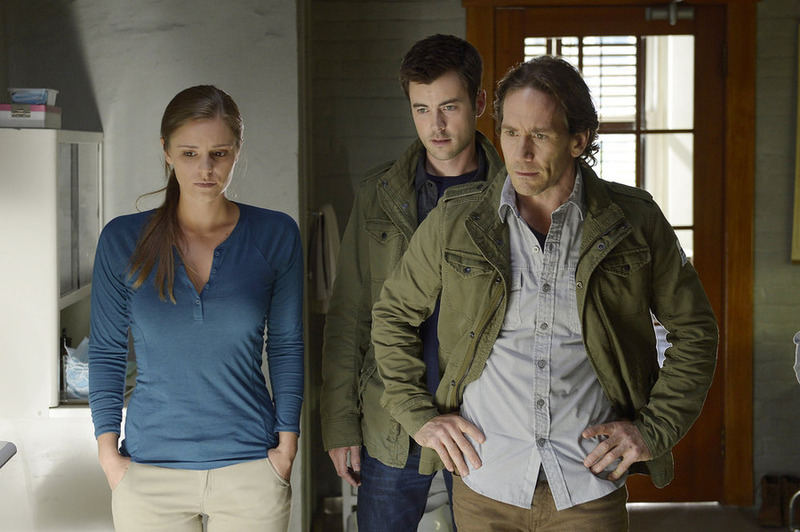 Helix returns tonight for its second season and it’s not pulling any punches. The action has moved from the Arctic to an island off the coast of Washington and there is a new disease on the verge of going global. OHSOGRAY participated on a call with Executive Producer Steven Maeda and star Neil Napier (Peter Farragut) about the twists ahead. Helix airs tonight at 10/11pm ET on Syfy. At the end of season one, I guess it was revealed that Peter may not be as nice as we thought. 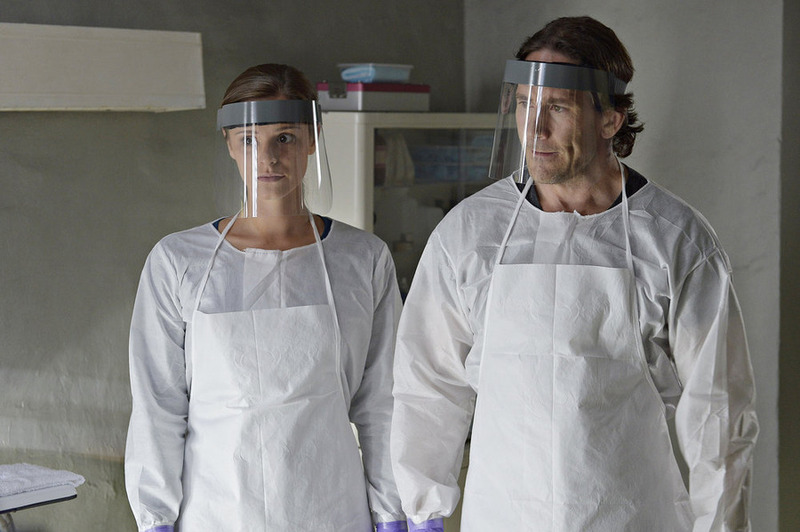 In the season two premiere, he seems to be back to business as usual and working with the CDC on this new outbreak. Can you just talk a little bit about that, and about your character and where we’re going in season two? Neil Napier: Sure. I can talk a little bit about that. I would say conflicted guy, rather than good guy, or bad guy. I always think of Peter as a guy who’s trying to do the best he can and live up to certain expectations he has for himself, you know, based on his relationship with his family of origin, the relationship with his brother Alan that we see – we get to see a little bit in season one. And in season two, we’re going to explore more of the relationship between Peter and Alan. And I think you’ve noticed some pretty interesting places, and will really help to inform why Peter is conflicted and you know seems to be playing for a couple of sides at once. But yes, I think we’re going to get a lot of that from season two. Steven Maeda: Peter is going through some very interesting places this year right now. Neil Napier: Oh yes. Very interesting places. Is he going to have a more prominent role now? Neil Napier: Right, yes. Well Peter – yes, as you said, Peter starts off you know on his feet (first off) which is a nice thing. But again, yes, he goes to some pretty interesting places, and we’re going to see quite a lot of Peter. And it’s really interesting. I think you guys are going to love the way this story unfolds for season two. So I don’t want to tell you too much because then it would be (stealing) from you. Steven, I’m fascinated by the dueling timelines. Can you tell us a little bit about that thought process behind that? Steven Maeda: Yes. Part of that was – the main part of it was that we wanted to be able to actually see immortality, which is a very difficult thing to see when you stay in the present. And so that kind of spun the whole idea of this Walker doing timeline. This season we decided to play with structure as well and kind of use –we’re going to see Walker in the future, we’re going to see Walker in the present, we may even be doing some flashbacks. So we really wanted to play with time and play with immortality in a visual way. Neil, can you talk about sort of the process preparing for the character in season one versus season two? Neil Napier: Yes, well season one and season two – I kind of went through pretty different preparation. Season one was – there’s really like, a pretty serious application of my imagination because I have no kind of frame of reference what it is to be a Vector and to be sick with NARVIK. So there was a lot of – a lot of play in imagination in that. And what was important to me was to keep my thumb on the man underneath the monster if you will, to really you know make sure that Peter retained his humanity throughout what was going on. As we came out of the end of season one, we see Peter’s cured. I don’t know how much residual effect from his ordeal in season one is carried through the season two – I mean, I know, but I’m not telling you. And – but spiritually and emotionally, mentally, there’s a lot of baggage that carries over from season one into season two, and I used a lot in season two, the preparation looking back to the journey that Peter had been on up to this point and informs where we’re going. Steven Maeda: I don’t how many people know this, but this is the story I told a lot during season one. 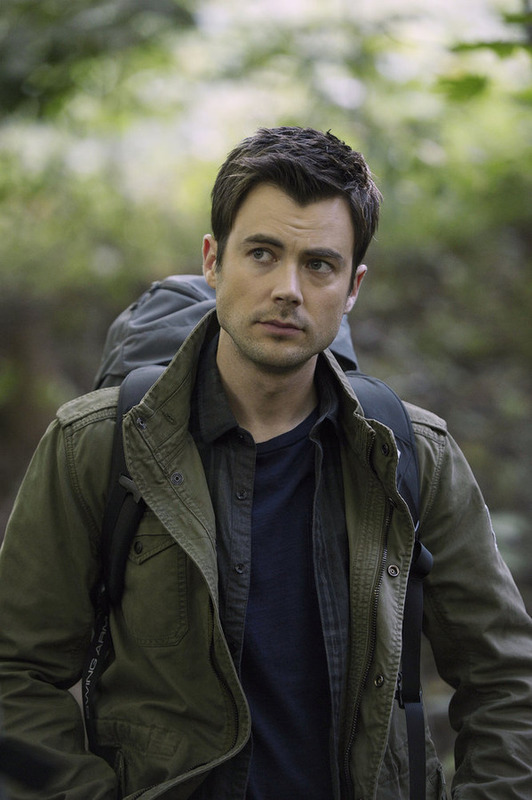 Initially, the character of Peter was dead in the original pilot. He had died, succumbed to the disease that became NARVIK. Then we made the decision before we casted Neil – oh no, let’s keep him around for a couple episodes then we’ll kill him. We cast Neil and he did a wonderful job. Then we thought maybe there’s something – yes, we’ll keep him around for a couple more. It wasn’t until we then did a flashback – or sorry, not flashback, hallucination sequence where we had a scene Neil out of the makeup and we went oh, what have we here – and look at him now. Neil Napier: I’m not dead yet. When and where the new season kicks off in relation to last season’s finale? Steven Maeda: Yes. Well what we want to do with the show is really do a little bit of reinvention with it, every season. That was always our plan from the get go. We did a little – a jump ahead in the end of last season going from the destruction of Arctic BioSystems from Paris. And so we’re jumping ahead in time again to this very remote area in the Pacific Ocean kind of off 20 yards away from Seattle. It felt to us like a very different place to have the show, but also a place where we could still play trapped, play claustrophobic. We’re jumping ahead – we’re probably about a year and a half ahead of the destruction of Arctic BioSystems from last season. As a result, what it does for us which is really nice is it allows us to start the characters in some very different places than where we left off, even jumping ahead a little bit at the end of last season. Then we get to kind of backfill and tell you the story of how they got there. How does that change of scenery affect the tone and mood of the show? Steven Maeda: [I]n a huge way, I think. I mean, just being able to go outside and shoot trees is a nice thing. I’m sure Neil would agree with this because he was the one who’s having to do it every day. But yes, I think we’re going to maintain our tunnel, we’re going to maintain the horror elements. We’re going to you know keep the things that made Helix Helix from last year. But definitely, it’s going to – the show will have a different look to it. Is it going to be soon that you deal with the fallout of everything and have everybody? Steven Maeda: Sure. So probably to say that everybody will be meeting up at some point. It will definitely happen before the end of the season, and the challenge for us was trying to keep the storyline both moving ahead in a way that was hopefully satisfying and is kind of an interesting thing to watch even though we’re watching both storylines from the same episodes going kind of different direction. But yes, we are definitely planning on bringing everything all together and having – I think that the reunions be they happy or sad, are going to be very rewarding when they finally start happening. Can you tell us about the new characters, Steven Weber and Matt Long? Steven Maeda: It’s a rebalance in a sense because some people are still doing the same job they were doing last season. It’s just having Peter on the team, I think, adds something different. Matt brought a completely different flavor to it and not having Alan on the team at the start, not having Walker on the team – those are things where you’re just forced to deal with a whole new set of relationships by virtue of people being absent. But then I think when we find out where they are and what they’re doing, I think it’s going to be very interesting and hopefully will be surprising and fun and take the show in some new direction. Neil Napier: Yes, I think it really brings a lot to bring in the new characters and to have characters that we know from last year in sort of different roles and in different relationship dynamics. Neil Napier: I think it was also a real fun challenge and gift for the actors themselves to explore these new relationships with characters that we know, but have not interacted with the other characters in this way yet. It was a real gift to get Matt and Steven on board this year. They were like, fantastic on and off screen. So we’re really blessed for that. 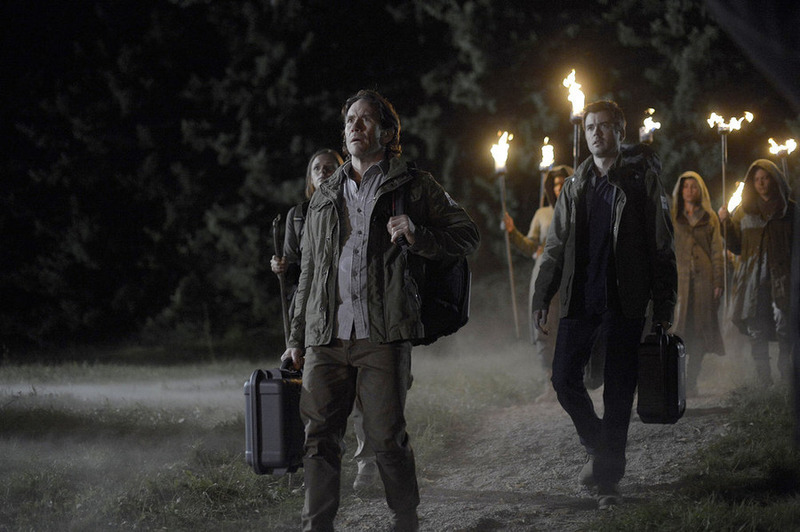 How does Steven Weber group kind of affect the team when they investigate the island? Steven Maeda: Yes, the Steven Weber group, it really is a cult of sort. They espouse a very kind of different worldview, and they have been living in isolation on this island for generations and bring a new set of obstacles to our people in identifying and trying to find the passages. Then of course you know there will be certain characters who have much more going on with that, than letting on initially. But I think it’s an interesting challenge, too… kind of parachute down into a group as we did season one and suddenly have to deal with an existing power structure as if in political situation and establish relationships and be kind of the new people there who are upset the upper card and push things around and start poking around in all the dark corners. Neil Napier: Yes, it really keeps all the CDC characters who are coming and starting to interact with these people, really off-balance, which is I think keeps it really exciting, because we don’t know what’s going to happen at any given moment. Is the whole immortal storyline still going to play a part in this season at all? Steven Maeda: Very much so. One of the things that we wanted to do is go to a different place and location-wise and to show – let the show have a different look to it and be dealing primarily with a new pathogen, but at the same time bring along our characters and bring along the vast story from season one. It’s not a complete reinvention. We’re not American Horror Story where we completely reinvent the wheel every season. But we do reinvent something and bring other pieces along. So yes, absolutely, we will be learning much more about the immortals this season. In terms of the main characters that survived the end of season one, are there any that we aren’t going to see back this season? Steven Maeda: Oh, that’s – that would be giving too much away. You will be seeing a lot of the main characters from season one in various incarnations. And one of the great things about Helix is does dead really mean dead. So let’s just say you’ll be seeing – you will be seeing lots of familiar faces from season one. As far as the time jumps are concerned, we have two time jumps in the first episode, how many more jumps are we going to have? Steven Maeda: I think there will be some interesting jumps. But primarily, there will be some interesting one-off storytelling where we jump back a couple of months. So where we jump back you know maybe a couple of hundred years. But primarily the show is going to be dealing in two time periods. We’re going to be in the present day on …with our CDC team, and we’re going to be with Walker as she does the investigation and the future on the island, which is not to say – sorry, motorcycle passing coming up – which is not to say that we’re not going to see here in the present as well, but those are the two time periods we’ll spend most of our time. Will we see continuation of the creepy, spooky, creative use of music in season two? Steven Maeda: Yes, absolutely. We are in the process right now on doing a lot of post-work and sound work on the show. And yes, we are absolutely planning on bringing along the musical styling of the first season into the second season. Neil Napier: Oh good, because I loved that. Steven Maeda: We’ve got some good ones. It looks like we’re out with the black goo and in with this yellow funky stuff, huh? So what would you rather contract, the NARVIK virus, or the new one? Steven Maeda: Well they’re both horrible. What do you think, Neil? Neil Napier: I don’t know. I’d go with – I don’t know, I’d go with Ebola. I’d rather contract Ebola, I think. No, they’re both pretty nasty. Yes, it’s a whole other world of hurt this year in Helix land. Yes, they’re all pretty bad. Is Peter going to have some major transformations this year? Neil Napier: Well, as Steve alluded to, there’s some really – Peter has some really interesting journey in season two. So yes, there is quite of – it is quite transformative for him, let me put it that way. Steven Maeda: Yes, take from that if you will. Neil Napier: Yes, it’s a transcendent and transformative experience in season two for Peter. There are a lot of twists and turns. There’s a lot of – for everyone in this season. And again, it’s –nothing is really ever what it seems. And we’re learning a lot – all the characters are learning a lot about themselves and about the reality they inhabit. So I think it’s a pretty wild ride. You guys are going to love it. In regard to the song, “Do You Know the Way to San Jose” is there a real significance behind that song? Steven Maeda: There is absolutely and certainly thematically. I think it plays some interesting questions about going home again and about success in the perils of. But yes, the song is not just randomly chosen. I mean, we definitely wanted to reprise it, but at the same time, we wanted this to pay off in a story way, and it will pay off by the end of the season, I promise. Whatever happened to the White Room and will we be seeing something like the Green Room in the island in season two? Neil Napier: I love that idea, the Green Room. Steven Maeda: Fantastic. The White Room is great. I love the White Room as sort of a – you know as a kind of a little clue and a misstep. And yes, we are going to be going all over the island. That’s one of those nice things being able to actually shoot a location, not have to – you know manufacture the Arctic every episode. We’re actually going to be out there at this location you know for the entire – you know most of the run as the 13 episodes. So we’re really looking forward to showing all the different parts of that location. Neil Napier: There are an awful lot of rooms. Neil, what was it like being one of the show’s monsters and do you miss it this season? Neil Napier: Well, I’m not sure that Peter is not one of the show’s monsters this season, but definitely in episode one, aesthetically he’s not at least. I kind of miss being the most interesting person on set. (We did not pick up) – people are always like, wow you’re so amazing. I’m like, well actually that’s the makeup guy, but thank you. But I don’t miss three hours in the makeup chair every day. I didn’t miss that. But last year frankly it was an honor to wear that art every day on set. I felt it was really elegant makeup and I wore it with pride. This year, I think what is a monster is left a little more to the interpretation of the audience you know what I mean? I think there’s a little more grey zone in that realm of what constitutes a monster. How are you going to maintain that horror going into season two and do you feel like you’ve actually upped the ante? Steven Maeda: Oh yes. We spent a copious amount of time trying to come up with what are the most horrible things that we can actually show on television. But we also want to make them interesting. We want them to feel organic to the story. And yes we love to come up with new ways to have the – these are the pathogen or other situation (inaudible) of itself, and that’s part of what the show. It’s definitely a horror show, and it’s very dark. But at the same time hopefully, darkly funny. Neil Napier: My wrap present in the writer’s room was therapy. For the Coastguard, we know that they are coming back to the island in two weeks. So will the events of this season all occur within that time period on the island, except for the flashforwards? Steven Maeda: Yes, the idea was to do a similar storytelling device what we did last season, which is to use the one day episode structure. And yes, we are flashing to some different places in time. But of the most part, we’re doing that same one day at a time structure. So yes, the plan is that the Coastguard comes back by the end, but they may – perhaps they will be making earlier here. For Neil, what can we expect to see as far as the relationship between the Farragut brothers this season? Neil Napier: We get to see a little more in-depth kind of what makes these two men who they are, and what – you know what the nature of the rivalry between them, where their love stands, where their jealousy stem from. Yes, and we really get – we get to see – yes, really what makes Alan Alan, and what makes Peter Peter from a family of origin perspective, yes, we get really into it. I love the stuff that I’ve got to do with Billy this year.